An international team of astronomers says that there could be many billions of planets not much bigger than Earth circling faint stars in the Milky Way galaxy. The estimate for the number of “super-Earths” is based on detections already made and then extrapolated to include the Milky Way’s population of so-called red dwarf stars. The team works with the high-precision Harps instrument. This is fitted to the 3.6 m telescope at the Silla Observatory in Chile. Harps employs an indirect method of detection that infers the existence of orbiting planets from the way their gravity makes a parent star appear to twitch in its motion across the sky. 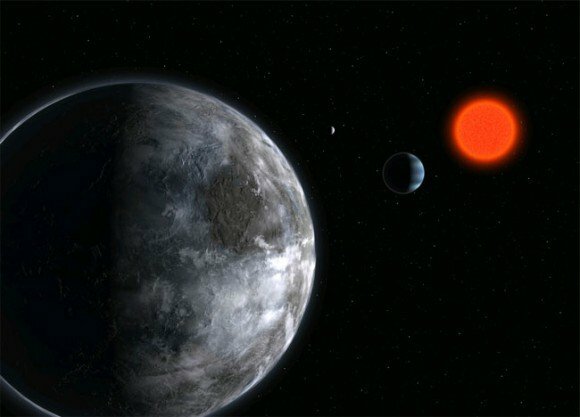 “Our new observations with Harps mean that about 40% of all red dwarf stars have a super-Earth orbiting in the habitable zone where liquid water can exist on the surface of the planet,” said team leader Xavier Bonfils from the Observatoire des Sciences de l’Univers de Grenoble, France. The Harps team came up with its numbers after surveying 102 carefully chosen red dwarfs, which are dimmer and cooler than our Sun. The group found a total of nine super-Earths (which are defined as planets with one to 10 times the mass of the Earth), with two judged to be orbiting inside their stars’ habitable zones. Putting all its data together, including observations of stars that did not have planets, the team was able to produce an estimate for how common different sorts of planets are around red dwarfs. This assessment suggests super-Earths in the habitable zone occur in 41% of cases, with a range from 28% to 95%. Given how many red dwarf stars there are in close proximity to the Sun, it means there could be perhaps 100 super-Earth planets in the habitable zones of stars that are less than about 30 light-years distant. “The habitable zone around a red dwarf, where the temperature is suitable for liquid water to exist on the surface, is much closer to the star than the Earth is to the Sun,” commented co-researcher Stephane Udry from the Geneva Observatory. The latest Harps research will appear in the journal Astronomy & Astrophysics.